The Buddha cell phone probably does not adhere to the Buddha’s Middle Path in design or appearance, but incorporates Buddhist aesthetics – down to the startup screen and ringtones! 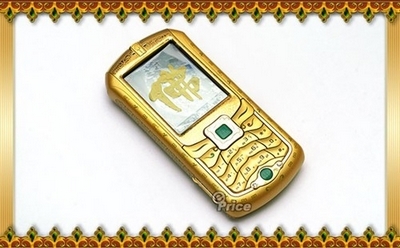 The specs for this customized Nokia N70 are downright flashy – a “golden” outer case that has apparently been made by using 24-carat gold plating over a steel base, a huge “jade” button for video (looks more like plastic), and a jewel encrusted camera. The other “regular” features include bluetooth, mp3/mp4 compatibility and video or still photography (duh). The screen also has handwriting recognition – which means, for example, you could just pull out the pen concealed at the side and write down insights that you might want to share with others. Pretty handy.